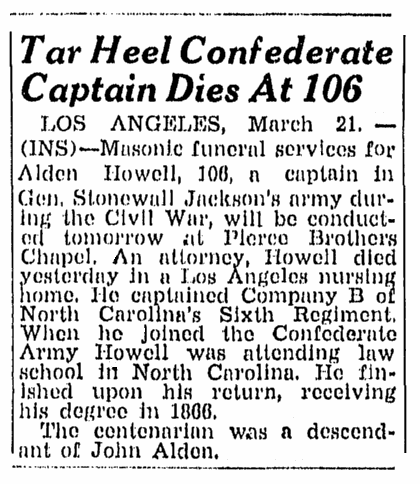 When Alden Howell passed away in 1947 at the age of 106, he was the last surviving commissioned officer of the Army of the Confederate States of America. It’s a good thing that there were multiple obituaries about this centenarian. Each historical obit gives us more of the details of his life. For example, see this old obituary in the Greensboro Record. We also pick up this critical piece of genealogical information: he “was a descendant of John Alden,” the famous ship’s cooper on the Mayflower, signer of the Mayflower Compact, and best known for marrying Priscilla Mullins. A great clue. In his ripe old age Howell was called upon to give advice, as reported in the Morning Olympian. Good advice – even now. Even in this feel-good news article we pick up more genealogical details. He was an attorney and banker in Waynesville, North Carolina. He retired “15 years ago and moved [to Los Angeles],” and this critical statement: “He and his seven-year-old grandson, Kenneth Brimmer, jointly cut a birthday cake Tuesday” – a good clue that both he and his grandson were born on February 18th. Genealogy Tip: Track down every newspaper article. Don’t stop with the first news article or obituary you find about your relative. Each one might contain the critical clue or fact that you need to build your family tree. Take those clues, verify the facts and document your family history. January 2015 Update: GenealogyBank Just Added 8 Million Records! Captain Alden was my father’s great grandfather on his mother’s side. 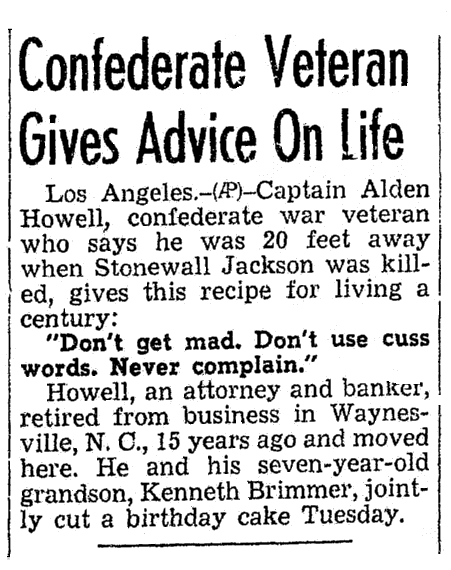 We have many newspaper clippings and even a letter from Mrs. STonewall Jackson. He was at the battle where Jackson was shot by his own pickets and present when he died 8 days after having his arm amputated. I have many interesting newspaper interviews as well if you are interested.